Thoroughbred fans at Murray State University have had a lot to celebrate on this 25 year anniversary of Reagan Field. The Breds kicked off their opening game on Reagan field in late February after the first phase of improvements was complete and ready for fans. Current terraced seating was blended with the new grandstand to include an additional 550 seats behind home plate, 238 chair back seats, 300 bleacher seats, and 12 handicap seats. The new grandstand is part of a phased renovation plan for Reagan Field that will continue as fundraising goals are met. Future renovations will include stadium lighting, a new press box, and an indoor practice facility. 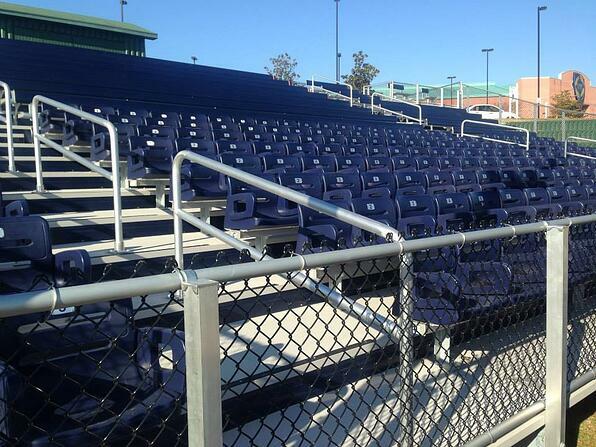 Toadvine Enterprises was in charge of the project and Dant Clayton was the supplier for the new seating. Although harsh winter weather continued to wreak havoc on construction of the facility and ultimately delayed opening day, the new, more intimate look of the field seemed to spark excitement on the parts of fans and players alike. The 2014 season started off with a bang in the newly renovated Reagan Field when the Breds started out with a 4-2 record on the season with three wins coming over MAC teams. On March 7, Morehead State opened up play in Reagan field for the OVC tournament, a match up that Murray State has missed out on for the past two years. This year, the Thoroughbreds have come on strong, hosting a heavily contested title on their turf. A modern inning-by-inning scoreboard in left field was a gift to the university from Pepsi Cola Bottling in Paducah, Ky. 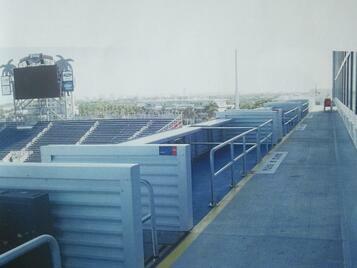 In 2006 a new sound system and backstop was added. Climate-controlled press box and spacious dugouts for the Breds to plot game strategy. Lush grass carpet is the centerpiece of the facility, including a newly resodded outfield which was completed during the off-season last year. The field first opened on March 11, 1989 when Illinois played Eastern Illinois prior to the Murray State game with EIU. In this game, Rick Grogan threw the first pitch and a day later, Willie Wilder hit the first MSU home run on the field. On March 30 of that same year, the field was also the site of Johnny Reagan's 700th career coaching victory, with a 7-5 win over Lincoln Memorial. The field was officially dedicated on April 15,1989 and named after coach Reagan. Murray State will finish up their OVC tournament play at the end of May with hopes of making it to the championship finals on May 21 to round out a stellar 25th anniversary for Reagan Field.